Loadbearing masonry with hollow core precast plank flooring is a most cost effective and quickly-erected building system, providing myriad long-term benefits to the owner. In v2.2 of SMART|dynamics of masonry, Southeast Concrete Masonry Association Executive Director Byard Stevens and Masonry Institute of Michigan Executive Director Dan Zechmeister, PE, FASTM, wrote Use Masonry for ALL Its Worth for high performance with reduced liability, reduced cost and reduced schedule. 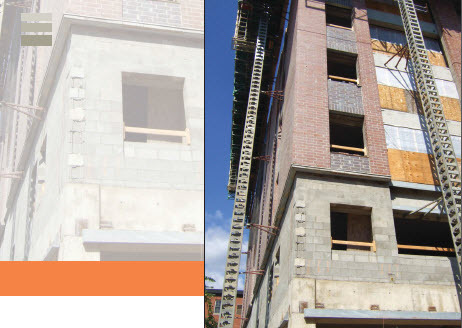 In the article, the authors identify five key ways to reduce potential liability during construction, making masonry a more efficient, attractive and viable wall system choice for meeting owners and builders expectations and architect design intent is summarized here just In Case You Missed It. Putting programs and processes in place to help ensure masonry is efficient and effective results in a better building and is a win/win situation for everyone, especially the owner, in the short and long term. Those five key programs and processes that could reduce liability and result in a better building are: special inspection, preconstruction meetings, mock-up panels, installer certifications and a quality assurance advisor. Inspection is an opportunity to observe what is not to spec or minimum code requirement before it is too late to easily make corrections. Depending on the level of inspection specified, certain inspection tasks will occur before and during construction. Some elements may involve continuous inspection while others require only periodic inspection. Masonry preconstruction meetings can clarifymany questions in advance. Material samples that have been received can be verified and/or submittal issues addressed. Reviews of applicable means and methods should also be accomplished at this time. Projects meeting TMS 402/602 Levels B and C Quality Assurance require mock-up panels, at least 4' x 4', be constructed of the materials and using procedures accepted for the work. The panel allows all parties to understand and be in agreement on materials and methods prior to construction. Many local and national masonry organizations provide training and certification programs for specific installation practices including flashing, grout, air barriers and more. Choosing contractors who have these certifications or requiring they complete them for a project will lessen the possibility of questionable installation practices. While not available in all markets, a quality assurance advisor provides another set of eyes throughout planning and construction, independent of the special inspector. The QA advisor works on behalf of and reports to the mason contractor. Learn more about making the most of a masonry wall system**during construction **so it performs for the life of the building by reading the entire article at dynamicsofmasonry.com/index.php/archives.